Brooks has had a foot in the trail running scene for quite some time with its flagship trail shoe the Cascadia, now in its 11th iteration. Along with the Puregrit series, the Adrenaline ASR and the newer Mazama lightweight trail racing shoe, brooks is showing an increased devotion to the trail. Now they’re producing trail-specific apparel. While most folks might not see a difference in shorts worn on the road or the trail, there are things you want in apparel that road runners won’t necessarily need. Durability, pockets, comfort. For many rail runners, durability is key. Softer and lighter shorts designed or road running might not cut it on a technical trail. Likewise, many road shorts have little to no storage space for keys gels, or whatnot. Brooks is trying to cater to specific trail running needs with this collection. Brooks was kind enough to send me a pair of the Cascadia shorts. With a 7 inch inseam you won’t be flashing all your thigh as you climb the nearest mountain. The fabric is a ripstop, water shedding material that really doesn’t carry water at all. I’ve worn these on two long trail races and two long training runs and was pleased with their performance. I didn’t notice them. That’s my requirement. 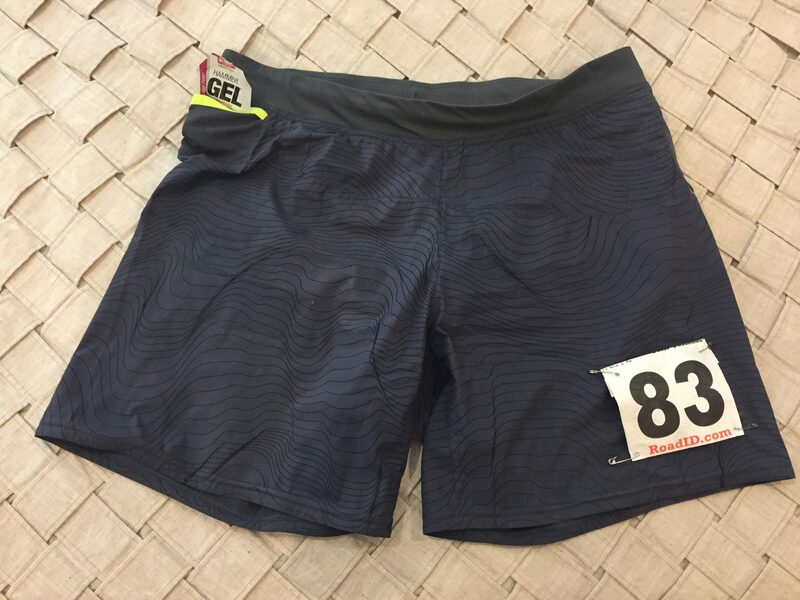 I don’t want to have to fiddle with my shorts or the waistband, or the drawstring after the race begins. That I wasn’t reminded of their presence the whole race is a major plus for me. Thick waistband. Comfortable in long races. The waist band is thicker than normal and isn’t your normal elasticized waistband. This is for comfort, for long races where you might want a not-so-snug fit for a day of running. The drawstring is elasticized and the waist fit is true to size. There are two small pockets on either side. One side has a water resistant zipper pocket which the other has an envelope style pocket. I could get three gels in each without too much difficulty. The zipper pocket does keep moisture out. I carried a tissue in that pocket on a humid warm run a few days ago and the tissue stayed dry. While I wouldn’t put unprotected electronics in the pocket, you can feel safe to put your car’s key fob in it without fearing totally moisture disaster. I was at a trail race one day and owed money to a guy I knew would be working an aid station. I put the money in the zippered pocket, humped and sweated myself across 13 miles, then ran into the guy and gave him dry money. Not bad. I’ve worn these on all my long trail races or training runs since receiving them from Brooks. They are now my go-to shorts for trail. Durable, comfortable, and dependable. Up next: a review of thermally sharp looking Cascadia Shell. Funnily, we are in a drought and haven’t had rain for a long time. If we don’t get rain soon, I’ll test the shell by having my son spray me with the hose.